Exclusive! 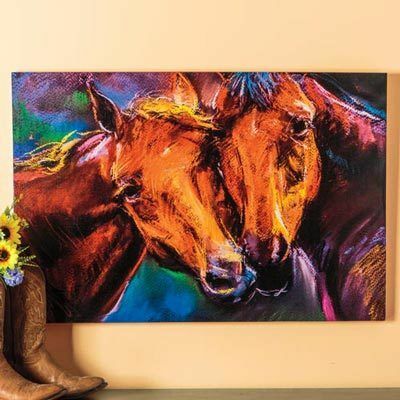 Hang our vibrant artisan canvas above a mantle, along a well-traveled hall, or in the den and enjoy this modern take on a traditional western theme. The bold colors and classic lines capture the imagination while the artist's subject is an enchanting view into the lives of these two best friends. Gallery-wrapped canvas on solid wood frame. Ready to hang with cord on back. Imported. 36"w, 24"h.
I bought this for my granddaughter for her birthday. She absolutely loves horses. I think she will love this for her room.